The UO administration has no problem making the academic side pay $75,000 towards the cost of the NCAA coverup – but tell us what they are spending our money on? None of your business, professor punk. Move it along, nothing to see here. 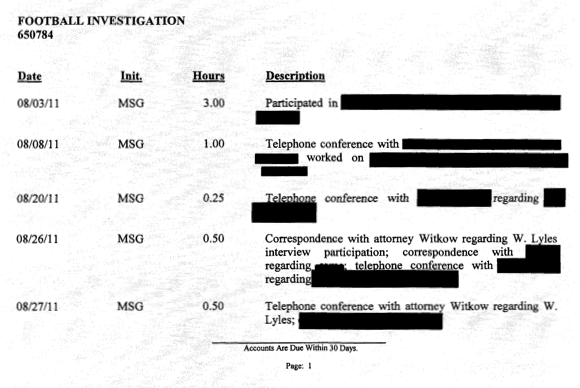 I’m no neuroscientist, but I wonder what a Fast Fourier Analysis of these redactions would reveal? Meanwhile, I’ve got a petition in to Attorney General Kroger to determine if UO is really allowed to do this. Should have an answer in a week or two. The Glazier contracts and other invoices are here. Tagged Michael Glazier, NCAA violations. Bookmark the permalink. Most attorneys bill in 1/10-hour fractions, i.e., for each 6 minutes. Glazier appears to be among the minority that bills in quarter-hour fractions. Doing so inflates the client’s costs, e.g., a 12-minute phone call billed as 0.2 hours vs. 0.25 hrs. Arguably attorney’s billing is part of the attorney-client privilege – thus confidential. A public entity doesn’t forego that privilege merely because it is publically funded. I can only speak to my California experience – but billing in increments of .25 is common and often easily justified. A phone call typically involves activity other than the call, e. g., preparation. Whatever attorney-client privilege regarding billing rates that may have applied here has obviously been waived by the client, as the UO has disclosed voluntarily the billing records.